In recent years the, consumer market saw an increasing number of small wearable devices (e.g. smart--watches) that include RF chips for various communications protocols. As most of these are intended give the user an enhanced experience, it is essential to have good knowledge of the influence the human body has on transmitted and received signals. In positioning for example, a lost direct path due to body shadowing can destroy any position related information that could be obtained from the exchanged signals. It was already shown that by adding some knowledge about the environment, reflections can in turn be used to improve the positioning accuracy. As the human body might again shadow some components, the goal of this thesis will be to examine these body effects and try to include them in positioning algorithms for increased robustness. We will assist you in planning and conducting a measurement campaign to examine the properties of the off-body channel, using e.g. UWB signals. After evaluating the measurements you should include the acquired channel characteristics in positioning algorithms. 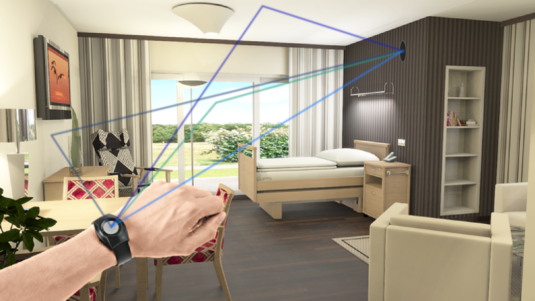 An overall different direction could also be examining gesture recognition for the purpose of a human-to-infrastructure interface, using machine learning to differentiate between gestures based on properties of the radio channel and the channel impulse response.